I read Andy Munro’s piece with mixed feelings. The first was a great wave of intellectual triumph. We’ve won that argument for the Central Library if this is all its opponents can say. ‘Monstrosity’, ‘entrance like a speakeasy’ (??? 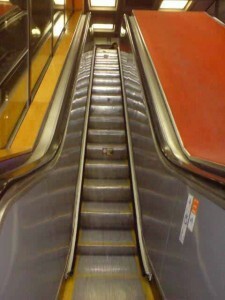 ), and lots of comments about the escalators and lifts. He didn’t refer to the leaks or the crumbling concrete so we must have won those arguments now. He didn’t refer to it being an obstruction to development so perhaps we’ve won that argument too – it was a node, a place where routes were to come together. That’s a couple of steps forward then. What Mr. Munro doesn’t do is engage with the building. Perhaps he can’t. Art and architectural history are a small subject. You can be educated to degree level and not know they’re there. That’s a comment on how woeful English education is on anything visual. So please may I put the arguments. I need to start with some background – sorry this is going to be a long post. The Library is a great work of architecture. First for historic reasons – first library of its kind in Europe, public building project of exceptional importance in its time – but even more for its design. If you read one work on architectural history, it might still be Sir Nikolaus Pevsner’s ‘Outline of European Architecture’. Pevsner, who virtually created the discipline in Britain, starts with a theory – that quite apart from styles, architecture developed its own essential qualities, first how to proportion a building (two dimensions), then how to mass a building (three dimensions), and finally and greatest of all how to mould the internal spaces inside a building so that they move and flow and impact on us. 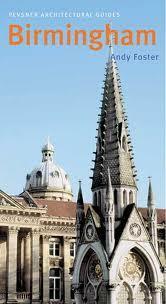 The greatest Birmingham architects did this kind of thing from the late 19th. century. J. H. Chamberlain’s School of Art plays lovely spatial games off the Museum hall with the flying staircases. Walk up the nave of W. H. Bidlake’s St. Andrew, Handsworth, from the entrance, and what seems a simple single space opens slowly out into passages and transepts which intrigue and fascinate if you have any spatial sense at all. That’s why that apparently modest building is rightly listed grade I. Or you can try his cemetery chapel down the road with its internal arcading creating spatial effects you don’t even imagine from the outside. The mark of a master hand. When I faced up to describing the Library for the ‘Pevsner’ city guide to Birmingham back about 2003, I didn’t know where to start. I was taught my architectural history by fogeys – right wing Tories in politics, and lovers of classical architecture – David Watkin and briefly Roger Scruton. The Library is everything I was taught to despise, by teachers for whom I’ve the greatest respect. But like most architectural historians I’m sensitive to spaces, slightly claustrophobic in fact (I did the Roman catacombs once. Once.) I use the Library regularly, and I noticed something – I never felt claustrophobic in it despite its big floors with low ceilings. Then I started reading up the contemporary descriptions and came across the Architects’ Journal’s account of its interior: ‘one glides through the spaces… effortlessly’. That’s the key. You walk into the entrance hall, and then something magic takes over. Along and up those escalators, and floors and galleries appear slowly to your right one after the other. There’s a certain point where, if you have any feel for spaces, you start to feel as if you’re floating. Along that corridor (which had glimpses of the concourse before they put up those boards), up that next escalator with a full view of the concourse, then at the top of the third one a window with a view right back to where you started, unifying the whole building. As you go up the reading floors, you’re never in an enclosed space. A series of wells link floors up and down so you always glimpse books and people below you, and above you. That was part of the client’s brief (Bob Taylor the city librarian who built it wanted people to be aware of all the parts of the building) but it’s wonderful architecture. I have never, ever, been in a building where space flows more wonderfully than the Central Library. It beats Baroque churches any day. Andy Munro refers to it having “been called Brutalist by architect buffs”. The architects who designed it don’t much like the word ‘Brutalist’ but it’s the one we now use. It’s a historical term which started as abuse. But so did most words for styles: Gothic once meant barbaric and rude; Baroque can still mean over-complicated. It’s the term in general use. In fact the outside is very carefully related to the buildings round it. John Ericsson, the surviving member of the detail design team, says they kept photographs of the Town Hall and the Council House on the office walls to keep reminding them of the buildings the Library had to fit with. And it does. Seven storeys high, and on a higher level, that ziggurat never overwhelms the historic buildings near it. That’s more than you can say for the 35 storey proposal in Colmore Row, or the ‘Beorma’ tower. What was most depressing about Andy Munro’s post was its cheap sarcasm: the ‘speakeasy’ (???). the British Rail lifts (please can I have BR back tomorrow? It was slow but reliable), and the references to architect buffs and Chelmsley Wood. Would he judge the Town Hall by its staircases, as he judges the Library by its lifts? The curse of modern Birmingham is a kind of matey, philistine ‘Good old Brummie’ anti-intellectualism. Mr. Munro’s is a perfect example. Don’t try and find out about something. Don’t try to understand a word or a building before you make a gibe about it. Do not engage brain before putting mouth in gear. It’s normal in comments on the Library from business groups like the IoD and the ‘Civic Society’. But I did expect that someone so closely involved with one of Birmingham’s historic areas as Andy Munro is, would know something about the history of buildings. What kind of danger is the Jewellery Quarter in from attitudes like this? This philistine attitude wasn’t around in the great period of late Victorian Birmingham, when J. H. Chamberlain was a member of the inner circles of the Liberal party (and helping conserve the Old Crown). Or the early twentieth century when William Haywood proposed a Beaux Arts transformation of the city in a book with a foreword by Neville Chamberlain. I think its source is the man who did more to wreck historic Birmingham than any other: Herbert Manzoni, who built the Ring Road and all those subways. An engineer with no training in architecture, he nonetheless pontificated about it: “As to Birmingham’s buildings, there is little of real worth in our architecture” he said in 1957. “Its replacement should be an improvement, provided we keep a few monuments as museum pieces to past ages”. I remember being dragged as a small boy by my mother to see the Market Hall, the first and perhaps greatest of his demolitions, before it came down. She was one of many ordinary Brummies who were outraged. “There you are, Andrew”, I can still hear her saying “that’s the Market Hall. You can say you’ve seen it. You’ll never see it again.” Later on I used the wonderful old Central Library before it too came down. It’s simple, Andy Munro. You are one with Manzoni and the people who demolished Victorian Brum in the sixties. Your attitudes are their attitudes, your mindset their mindset. You’ll keep a few historic buildings in the Jewellery Quarter, like Manzoni’s ‘museum pieces’. But you want to demolish a very great work of architecture. Do you really want to be like that? And do you want Birmingham to have a continuing reputation as the most philistine city in England? If not, here’s a simple challenge – I’ll walk you round the Library and explain it to you as best I can. And that’s an offer to anyone else too, who wants to understand it but perhaps is still in two minds about it. Andy Foster is Chair of the Friends of the Central Library Group.